Make this bread! Even if you’re yeast-0-phobic, even if you think you can’t bake a bread to save your own life, …PLEASE make this bread. I’ll hold your hand throughout, and toast your success at the end! Make the poolish the day before: add water to a bowl, sprinkle the yeast on top, add the flour and mix until smooth with a large spoon. Cover with plastic wrap and let it stand at room temperature for 12 to 16 hours (ideal temperature: 70 F). This is what the poolish will look like the next day…. 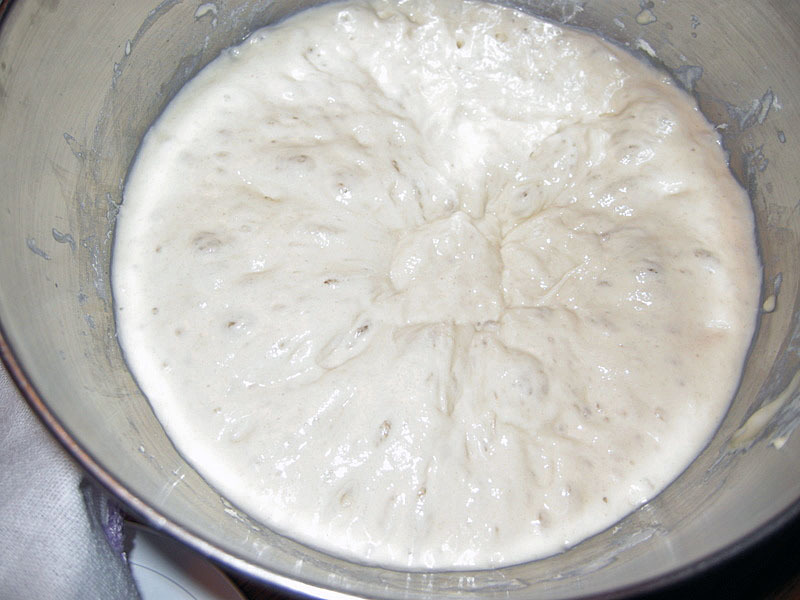 Prepare the dough: add the flour, water and fermented poolish to the bowl of a Kitchen Aid-type mixer. Don’t add the yeast or the salt yet. Mix on first speed (or by hand) until it all comes together in a shaggy-looking mass. Cover the bowl and let this mixture rest for 20 to 30 minutes. Add the salt and the yeast over the dough, turn the mixer to the second speed and mix for 2 minutes. Ideally, the temperature of the dough should reach about 76 F. If kneading by hand, then work the dough until it’s smooth, about 6 minutes. Cover the bowl and let it rest for 25 minutes. Give a quick couple of folds to the dough (as shown here), let it rest 25 more minutes. 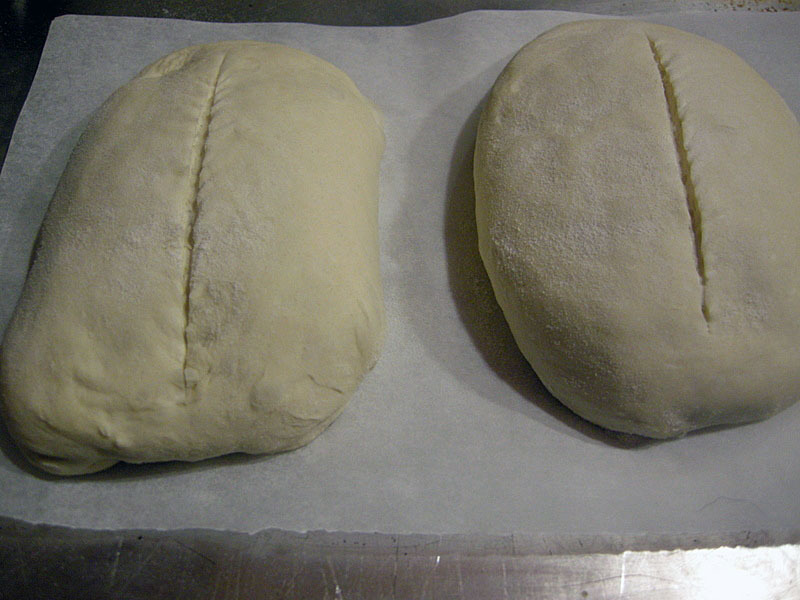 Fold the dough a couple of times again, and let it rest 20-25 minutes more, undisturbed. Gently divide the dough into two pieces, trying not to deflate it too much, and place them over lightly floured kitchen towels. Cover, and let them stay for 20 to 25 minutes at room temperature, for a final quick proofing. No need to shape the loaves in any particular way. Invert the dough over parchment paper, so that the floured side is now up. Slash the bread quickly with a single stroke of a razor blade or sharp knife. 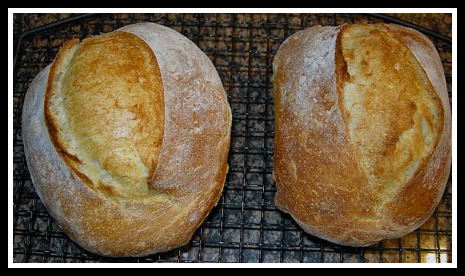 Bake the loaves in a 460F oven, with steam (add ice cubes to a baking pan placed at the bottom of the oven, or use any method of your choice to add steam in the initial baking time). The bread will be ready in about 35 minutes. Let them cool completely on a rack before slicing. Comments: My expectations were not too high for this bread when I first made it: no wild yeast, no involved kneading and shaping. When the loaves were ready to go into the oven, they seemed too flat, with a tendency to spread. However, they had nice oven bounce, and the simple slash perfectly coached them into the final shape. Each loaf was light as a feather, with a nice crumb and subtle sour flavor, thanks to the poolish. Celia, I look forward to your posts about “Bread” – a ton of stuff to bake from that book…. I can’t wait to try this bread. It looks so tasty and I bet will be great with some wine and cheese! You too, have a wonderful weekend, I hope you will have wine, cheese, and great bread on your menu! Such a nice recipe, isn’t it? I felt a thrill when I opened the oven and saw them all puffed up… yeast is a beautiful thing! Hi Sally, your bread looks amazing. I’m wondering about the 70 degrees being the perfect temperature. Living in Florida, I’m lucky if it’s less than 76 in here during the day. Did you keep it at 70 degrees? But I decided to list the temperature, since he states in the book – I tend to be very flexible with these conditions. Thank you Sally, this recipe looks amazing. I need to try to make pain rustique Sally, I have the book and I shall look in to it. It’s one of my favorites, although the ones I make the most are the Vermont sourdough series, all pretty awesome… That book is a must-have! You don’t need to hold my hand or even give me a gentle push. I’m bookmarking this now! I lost my starter and I’m starting to use yeast for the first time in years. It’s fun but I miss that fermented flavor. This bread looks like a great substitute for sourdough! Hello (again) Sally. When I congratulated you on your sourdough bread recipe I said I was going to try your Pain Rustique recipe and implied that I might even comment. Well I’ve tried it today (don’t forget that we are 6 hours ahead of you) and, after starting the poolish yesterday I was able to complete the baking this morning starting about 1 a.m. your time. It was cool enough to lather with butter, the real thing (which I am pleased to announce my G.P. will never find out about) just about half an hour ago. Firstly, congratulations from this side of the pond yet again. So easy. And it was so delicious. From that you may guess that I made a couple of adjustments for the European palate. Any one who wants to incorporate them should realise that the two sides of the pond do have subtle differences in food taste and the (small) changes may not be to U.S. taste but I pass them on in case anybody on either side of the Atlantic wants to try them. Firstly, I used half the salt in the recipe. I know it helps with the proving but it struck me as not being to modern European taste (or health advice). It worked out fine. Still a good, light dough and sufficient salt there for taste, particularly if you have high B.P.. I stress that Americans tend to eat more salt than Europeans and it may not be to their liking. The only other change was a very European one. When I went into the final mix I added 2 level tablespoons of a very light olive oil. Just about every European bread recipe I have seen recommends the addition of a small amount of oil or fat (fat=shock horror). They just about all say ‘optional’ but I find it makes the dough more stretchable if you are kneading by the hand method of ‘stretch and fold’ and certainly .makes the dough more ‘pliable’. It also increases the shelf life without nasty chemicals. I am sure if you are using an electric mixer it is not strictly necessary but we are old fashioned here (and I don’t mean the drink, lol.). Whatever, do NOT use Extra Virgin Olive oil, it should be for texture, not taste. Hope you are not offended by my putting my European suggestions on your blog but, I’ve found that very few cooks object if people want to suggest alternatives to their recipes and if you think I am being rude, just edit it but these are purely variations that people may (or may not) want to try. Once again, even if I am 3 years late, many thanks for probably the easiest recipe I have ever seen for genuine (and delicious) pain rustique.